Audio plus Visual. Loud Enough. Works Consistently. Ear piercing for visitors. Gentler tone not offered. Hearing severely impaired. Hearing/visual impaired. Wins attn over loud TV's. Family of Elderly Person. Technical helper for Mom. Caretaker for mom. It is loud enough to be heard over the TV for my severely hearing impaired mother-in-law. On the loudest setting, the tone is very piercing for visitors who have norma hearing. I don't think I would have chosen this model had I heard it. Her previous unit which she had for many years was excellent but not piercing. 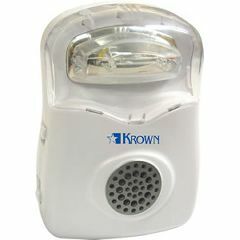 The strobe light will help alert her during the night when she is not wearing her hearing aid.